HostGator Vs GoDaddy Comparison September 2018 - Which is Better? Home Comparison HostGator Vs GoDaddy Comparison September 2018 – Which is Better? GoDaddy and HostGator are two giants when it comes to web hosting. While GoDaddy is the leading registrar of domain names, HostGator is the leading hosting provider. They are both hugely popular and similar in what they offer, and that is affordable budget web hosting. In this GoDaddy vs HostGator comparison, we compare the two hosts side by side and choose a winner based on Performance, Uptime, Quality and Customer Support. HostGator and GoDaddy both promise a high uptime of 99.99% each month. HostGator uses Linux x86 CentOS 6 64-bit operating systems, while its servers run on Dual Xeon E5520 2.26 GHz Quad Core processors. GoDaddy provides customers the choice of choosing between Linux and Windows OS before signing up. And their servers run on Intel Core i7 processors. HostGator sites are hosted in their data centers at Dallas. The data centers are well equipped and connects to 10 backbone providers. Also, HostGator invest millions of dollars every year in new technologies for better performance. They have about 12,000 servers under management at Houston, Texas in the US. GoDaddy also gives 99.9% up-time for your websites too. Their servers run on Core i7 processors. Speed is an important factor to consider before choosing a web host. So I purchased two domain names and hosted each one on both HostGator and GoDaddy with same theme files. I used Pingdom to check the loading time of two test sites. HostGator loaded in 1.34 seconds to load which is a good speed. GoDaddy was slower takin g around 1.84 seconds. HostGator test site was twice faster than GoDaddy. We also tested the performance of blogs hosted on HostGator and GoDaddy over a period of 30 days. HostGator’s response time was better than that of GoDaddy. Clearly, HostGator beats GoDaddy with better response time. The next test we performed between the two hosts is GtMetrix benchmark test. You can clearly see HostGator has better response time and page speed score. HostGator loaded in just 0.8 seconds, whereas, GoDaddy took 1.6 seconds to load. That’s twice slower than HostGator. HostGator uses cPanel, the most used control panel. You don’t need the help of a geek to use it. It provides everything you need. It is important to have a user friendly interface and these one-click script installers are a boon to all newbies who do not have much experience with these platforms. GoDaddy, on the other hand uses its own customized control panel. It does provide script installers just like the conventional cPanel’s feature. But the interface is quite different than the conventional cPanel. This custom control panel that GoDaddy use may not be as good to eyes as cPanel, but you will get used it very quick. Good customer support play significant role in building company’s goodwill, which originate trustworthy relation between company and a customer. In HostGator vs Godaddy race to become top hosting giants they compete with each other to provide fast, better and quality customer support. In our experience we saw that company providing more options to facilitate a customer always win. Godaddy recently shutdown its live chat support and focused mainly on providing 24/7 landline support. This is the only support they are providing to its customer right now. They are launching call centers in different countries to increase their response time. Currently their expected wait time is from 6 to 8 minutes on call. Hostgator is very flexible if it comes to a customer support. They not only provide 24/7 landline and live chat, they also are very responsive if anyone wants to create a ticket and wanted too check their reply on later time. Which make hostgator a better customer support. HostGator has three web hosting plans, namely the hatchling plan, the baby plan and the business plan. The hatchling plan being the basic one which allows you to host only one domain, while the rest can host unlimited domains. All feature unlimited bandwidth and disk space which is boon for every webmaster. All plans offer unlimited emails. The business plan, in addition to all the above features gives a toll free number as well. HostGator provides anytime money back guarantee for the first 45 days. Update: September 2019: HostGator Shared Hosting Plans with Free SSL for as low as $2.75/mo. On the other hand, when it comes to GoDaddy, they have three plans; Economy, Deluxe and Ultimate. All these plans provide unlimited bandwidth. The Economy plan can host one domain while the other two can host unlimited. The Economy plan provides a 100GB limited diskspace, whereas the other two provide unlimited diskspace. 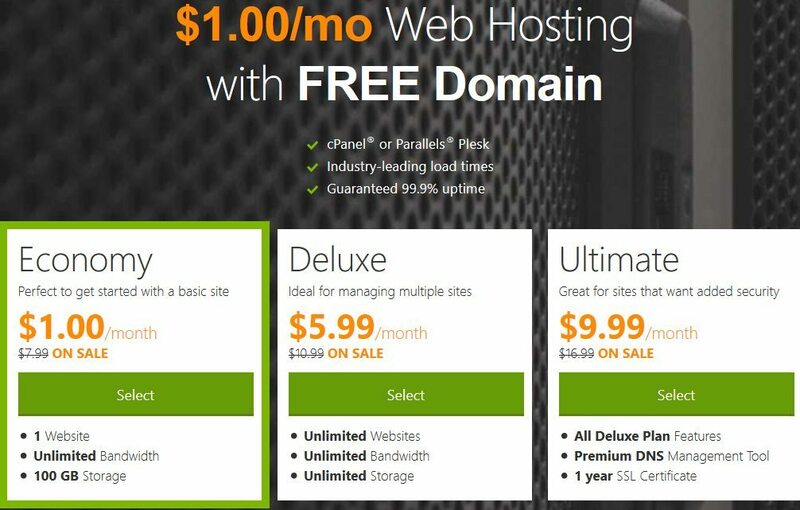 GoDaddy offer 100 and 500 emails in the Economy and the Deluxe plans respectively; whereas, only the Ultimate plan provides unlimited email addresses for your domain. Winner: GoDaddy – Unlimited plans start at $4.49/month. My Recommendation – GoDaddy or HostGator? HostGator tops our rankings for a reason. Their size has allowed to strengthen every aspect of their service, from user support to value for money. In pure hosting terms it’s comfortably ahead of GoDaddy and we wholeheartedly recommend it. But — and it’s a real but — GoDaddy’s appeal is convenience. Whereas HostGator is purely a web hosting company, GoDaddy plies its trade in hosting, domain registration, and website building software. Bring those services into the equation and for some GoDaddy actually offers better value.